When you think about wedding preparations there is list as long as you can imagine of considerations and bookings to make! Some of the most important tasks to look at are to book any services or suppliers you require for the big day well in advance – particularly over the summer months when weekends are often packed with celebrations, popular venues and suppliers will quickly become booked up. The last thing you want is to be disappointed if the venue that you had your heart set on is already booked for your special day! When you book a supplier or service you want to know that you are working with someone who is experienced in weddings, who understands how important the day is and will try and ensure this goes to plan. If you are looking for a special venue and want the best possible service around why not consider hiring a marquee for your celebrations. Standard wedding venues in Tewkesbury and the Surrounding areas can offer a wedding package but this cannot be personalised as uniquely as marquee hire in Gloucestershire from Windsor Marquees. Based in Gloucestershire, if you are looking for Marquee hire in Gloucester and the surrounding areas of Worcestershire, Forest of Dean and Tewkesbury then Windsor Marquees can provide a range of marquees and accessories for any size of event. All packages include installation and erection along with provision of furniture in a style to complement your wedding theme; they can also provide attendants on the day to help with any tasks. 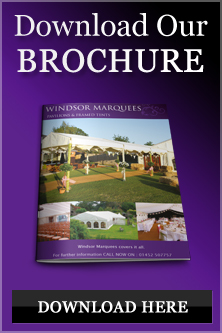 Don’t compromise on your wedding venue – choose Windsor Marquees for your special day!